Bobby Hofman was born October 5, 1925 in St. Louis, Missouri. Hofman grew up playing baseball with Yogi Berra & Joe Garagiola on the fields of the Italian neighborhood known as the Hill in St. Louis. Hofman & Berra were teammates together in American Legion ball. One day because there were no dugouts, Berra was sitting cross legged on the floor. Hofman told his friend Berra 'You look like a yogi' sitting there like that. The name of course stuck, the rest is history. It’s Bobby Hofman who gets credit for giving Lawrence Peter Berra the nickname Yogi. 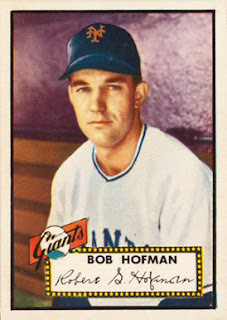 Hofman was an all around infielder, getting signed by the New York Giants as an amateur free agent in 1946. He came up briefly in 1949 hitting only .208 in 19 games. He went back to the minors for two years then returned to the Giants in 1952 batting .286 in just 32 games. For the next five years he was mostly as a pinch hitter as well as a utility infielder. Hoffman was an excellent pinch hitter, hitting nine career pinch hit home runs. On May 5th 1953 he came to bat as a pinch hitter in 2-2 tie game against the Pirates in the Polo Grounds. Hofman hit a dramatic walk off HR for the game winner. In 1953 he had a career high 12 HRs & 34 RBIs playing in only 74 games (169 at bats) mostly at third base. He again was a key pinch hitter and reserve infielder during the 1954 Championship season but did not appear in the post season. In 1955 he played a career high 96 games with 10 HRs, 28 RBIs and a .266 batting average. He even tried a hand at catcher playing 19 games behind the plate that season. He only appeared in 47 games in 1956 & by 1957 appeared in just two at the Giants last season in New York. In his seven year career he played in 341 games batting .248 with 166 hits 32 HRs 22 doubles 6 triples a .322 on base % & 101 RBIs. The versatile fielder played 85 games at short (.969%) 49 games at first (.997%) 45 games at third (.899%) & 26 games behind the plate (.100%). Retirement: After his playing days he coached under his old team mate Alvin Dark, for the Kansas City A’s & the 1974 World Champion Oakland A’s. Hofman was also the traveling secretary for Charles O. Finley, the controversial owner of the Oakland A's. 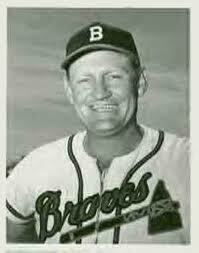 He also coached with the Cleveland Indians & Washington Senators. Hofman was also a manager the minor leagues. Passing: He passed away of cancer on April 7th, 1994 in Chesterfield, Missouri at the age of 68. He was survived by a wife and daughter. 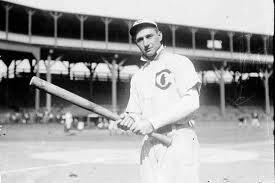 Family: He is the nephew of "Circus" Solly Hofman who played for three Chicago Cubs World Series teams from 1903 to 1912. Solly was mostly an outfielder who played 14 seasons in the big leagues; with the Cubs (1904-1912 / 1916) Pittsburgh Pirates (1903 / 1912-1914) & the Buffalo Blues (1915). Solly was a career .269 hitter with 1095 hits 162 doubles 60 triples 19 HRs 208 stolen bases & 495 RBIs.